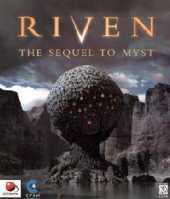 Riven is the sequel to the highly successful computer game Myst and was 4 years in development. It was distributed initially on five compact discs and later released on a single DVD-ROM with a 14 minute making-of video and higher quality graphics. The Myst style of gameplay in which the player clicked on objects within prerendered still images and videos was maintained in this sequel, however it was enhanced with many animated scenes. It is widely regarded by players of Myst and other adventure games to be the most artistically beautiful and heuristically difficult game in the Myst franchise. Like its predecessor, Riven is a point-and-click adventure game taking place in a first-person perspective. Players explore interactive worlds using the mouse to click on items shown on the screen. Riven continues the story of Myst. We are introduced to Atrus' father, Gehn, who is a little, well, crazy. He has kidnapped Catherine, Atrus' wife, and imprisoned her somewhere in Riven, a place made up of several islands in the middle of the ocean. Atrus has enlisted us to help him rescue Catherine and capture Gehn. Again we must solve numerous puzzles and delve deep into D'ni history to complete our quest. Players can interact with objects such as switches or items in this manner. The cursor changes in appearance depending on what a player is pointing at. For example, when the player positions the cursor near the edge of the screen, the pointer changes from the shape of a pointing hand to a bent finger; likewise, the cursor changes when the player can look up or manipulate an object. Like Myst, Riven has an optional method of moving known as "Zip Mode". This allows players to skip to areas already explored, but can lead to players missing important clues. 1 2 3 Level Demo included in Prince of Persia Collection (1998) ISO Demo 597MB (uploaded by Shattered) * Prince Of Persia v1.4 Prince Of Persia 2 v1.1, Video of "The making of Prince of Persia 3D", Nightmare Creatures without CDA tracks, and demos of Riven, The Journeyman Project 3, and Warlords III: DarkLords Rising.